We are moving on to Siena. 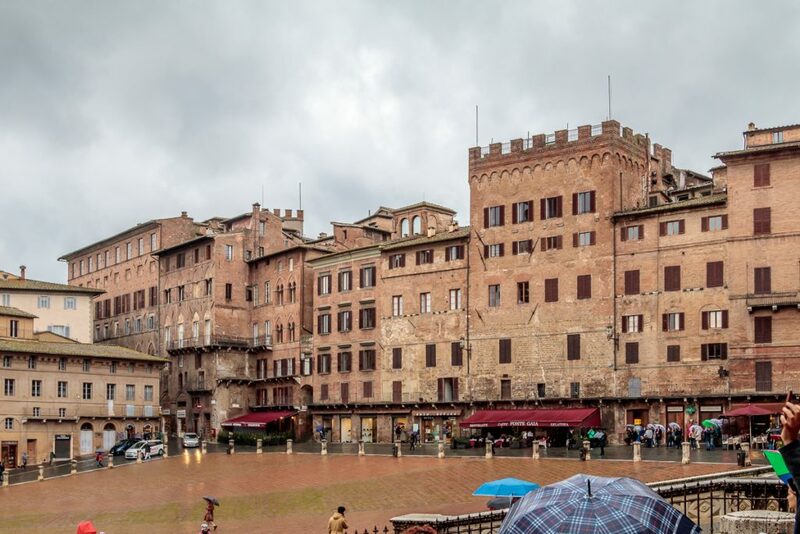 After a short drive from Florence, we arrived at our hotel, dropped our bags, and started off toward the center of town in the rain. Unfortunately, our time in Siena was accompanied with rain. However, we weren’t going to let a little rain slow us down. 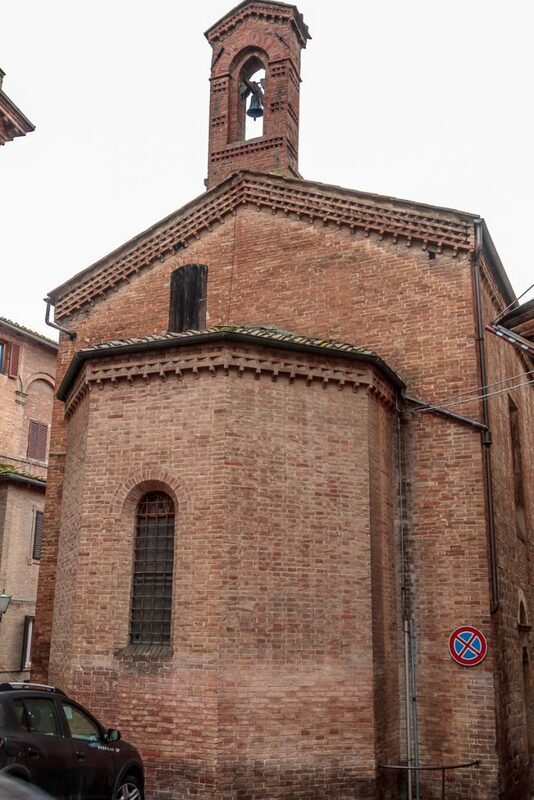 Not far from the hotel we came across this old church, Santa Maria delle Nevi, Saint Mary of the Snows, built in 1471. This is the back side of the church. The interior is notable for the main altarpiece depicting an Enthroned Madonna and Child with Saints Peter, Lawrence, Catherine of Sienna and John the Evangelist (1477) by Matteo di Giovanni. 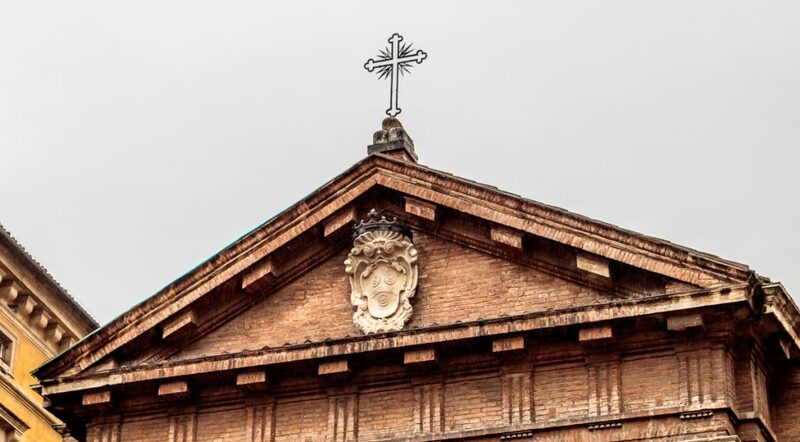 The Virgin is surrounded by angels with chalices of snow, recalling the miracle that led to the veneration at the church of Santa Maria Maggiore in Rome. 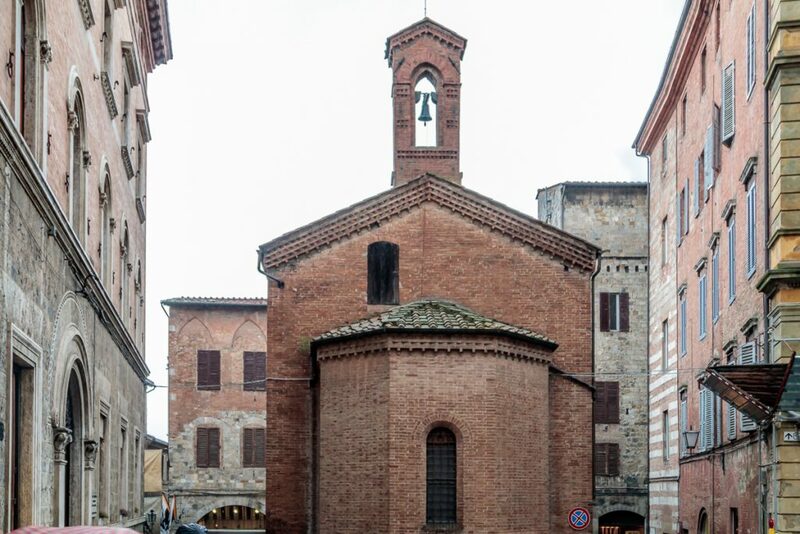 Chiesa di San Cristoforo, Church of Saint Cristopher, was built in the 11th to 12th century. 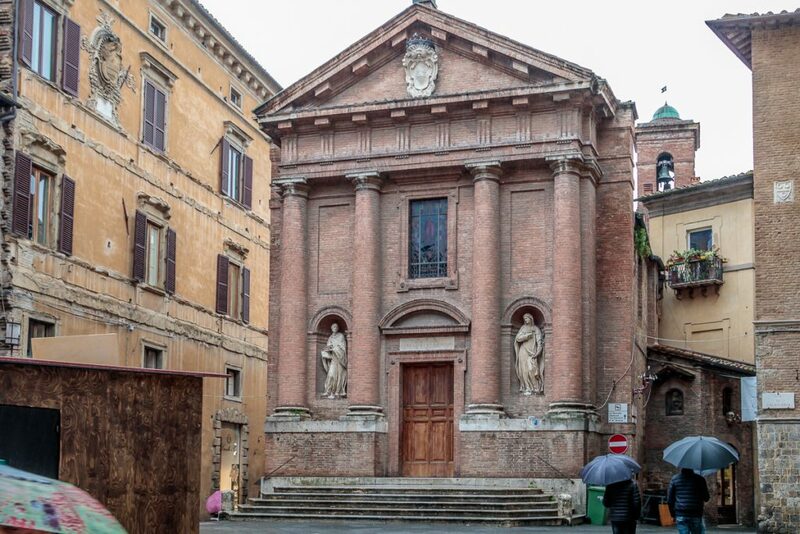 In 1800, a brick Neoclassical temple facade was added with four columns and tympanum. 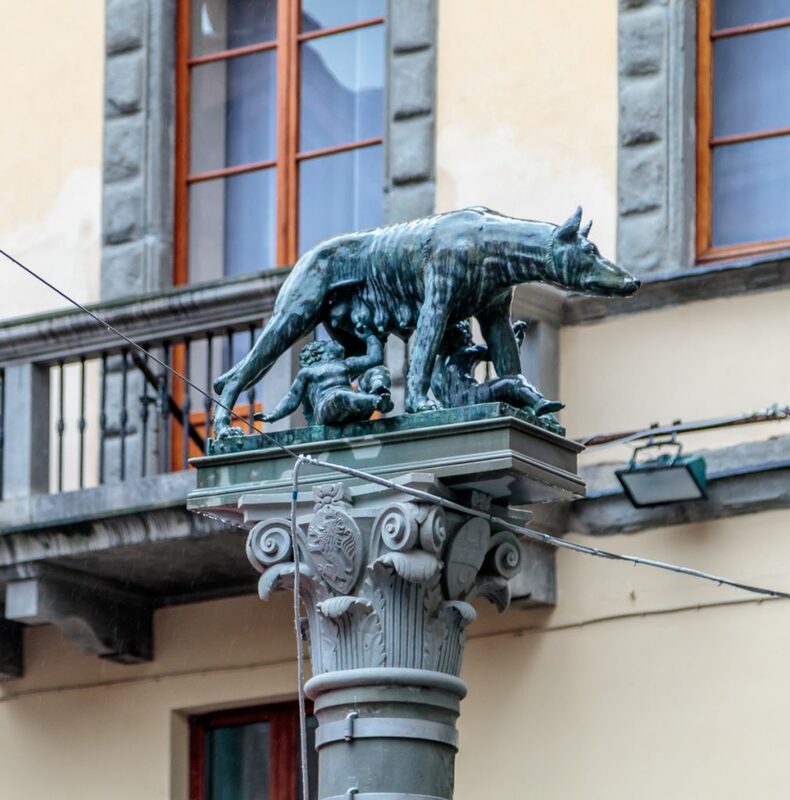 Romulus and Remus, the legendary twin brothers, suckled by a she-wolf, founded Rome. 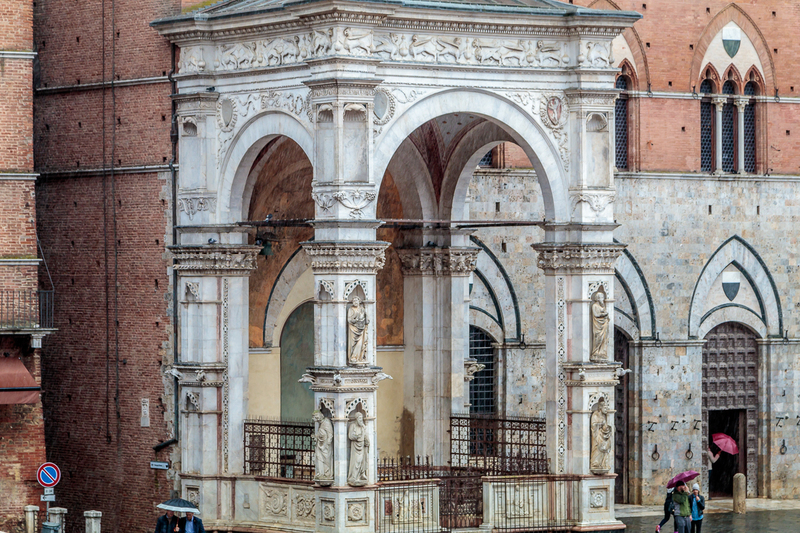 Statues similar to this are found all over Florence, Siena, and Rome. 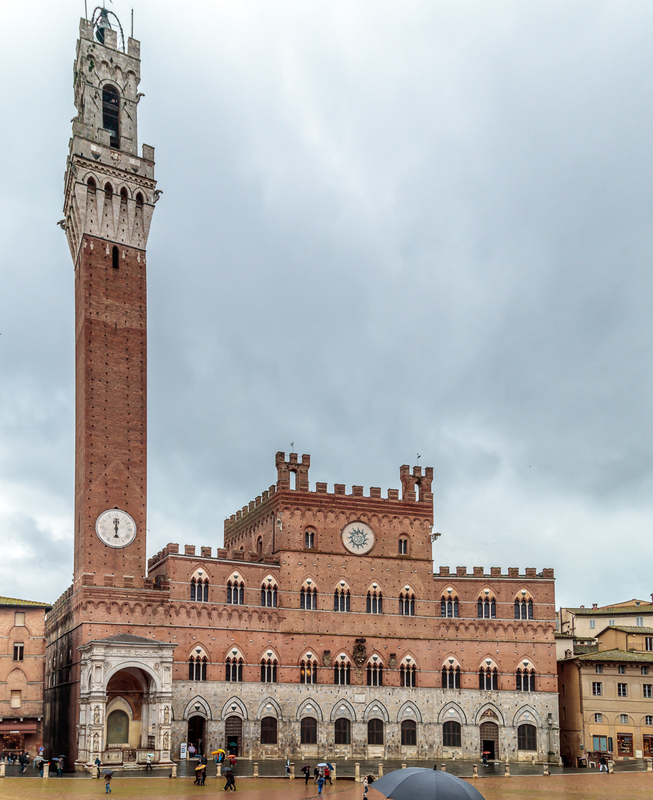 We soon arrive at the central piazza in Siena, dominated by Palazzo Pubblico, Town Hall. Construction began in 1297, intended to house the local government. 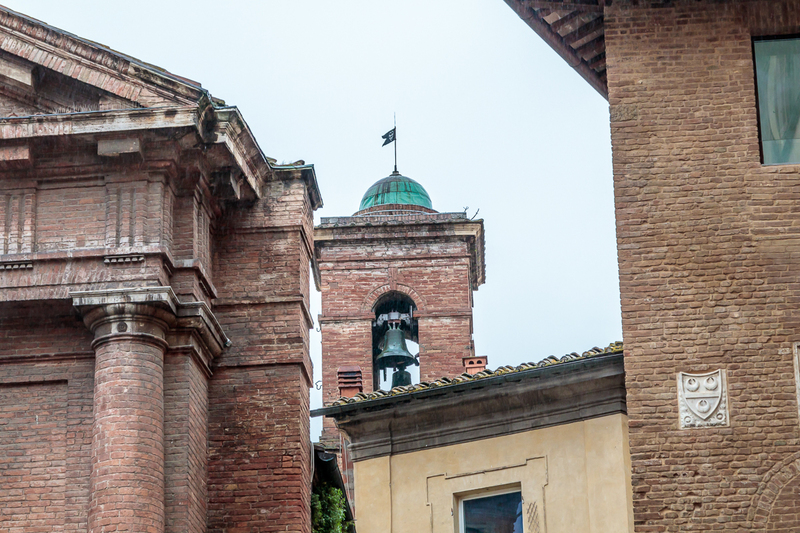 The bell tower was build between 1325 and 1344. The tower was designed to be taller than the tower in neighboring Florence and was at the time the tallest structure in Italy. 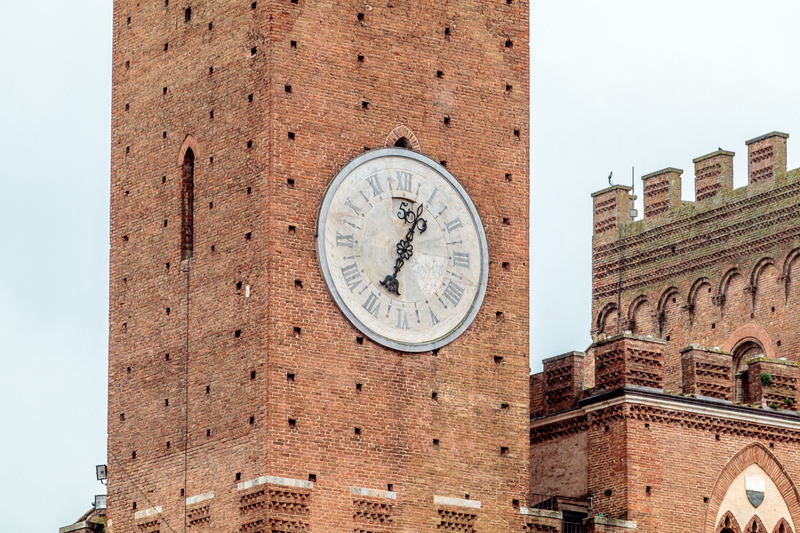 The mechanical clock dates from the mid 14th century. Note that the clock has only one hand and reads the date. We were there November 5. The palazzo is the main focal point of the central town square, Piazza del Campo, Piazza of the Field. 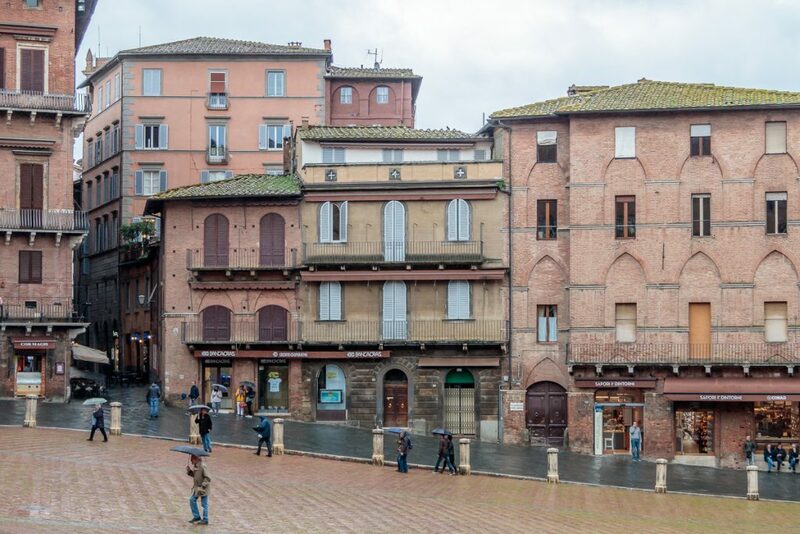 This is the central piazza of Siena and is a sloped, shell-shaped piazza. It was previously an open field that lay between three hill-side communities that coalesced to form Siena. It was paved in 1349 in a fish-bone patterned red brick with nine lines of travertine. The lines radiate outward from the water drain in front of the Palazzo Pubblico. The number of divisions represent the rule of The Nine (Noveschi) who laid out the Campo and governed Siena between 1292 and 1355. 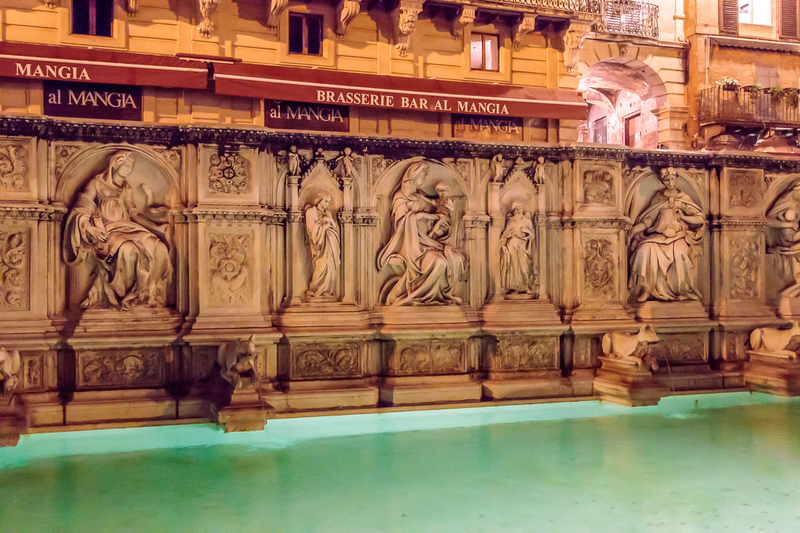 Fonte Gaia – This the fountain at the focal point of the piazza del Campo. It was build in 1419 in the central high point of the fan-shaped piazza. 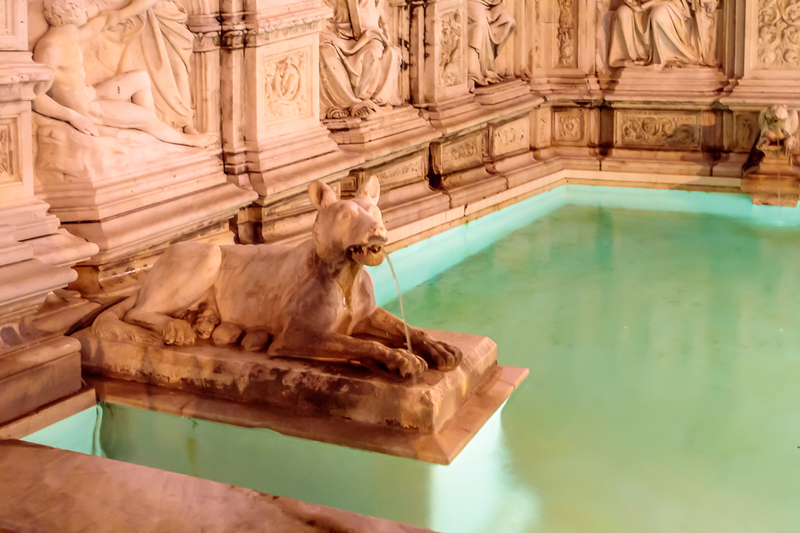 It is thought that water probably reached Piazza del Campo in 1342. The Sienese celebrated with great enthusiasm and this fountain Fonte Gaia (Joyous Fountain) was built. 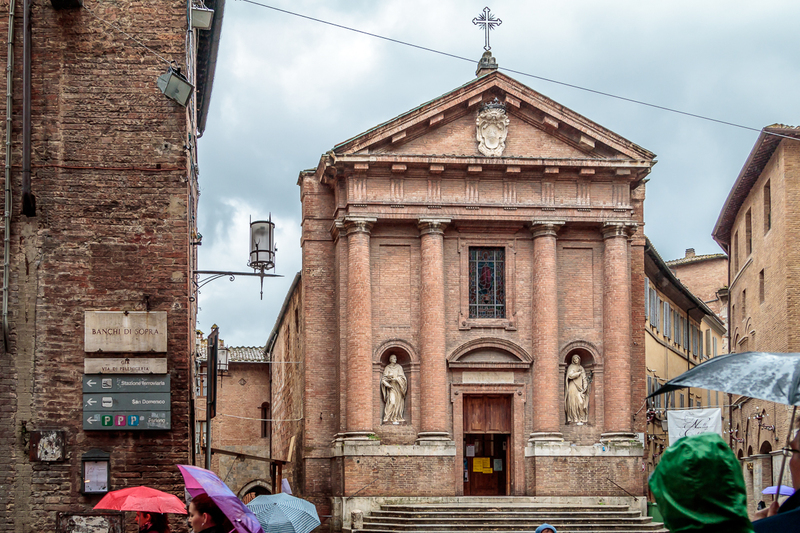 Siena is divided into 17 Contradas or districts. The Contradas are spectacular agonistic institutions each having their own government, oratory, coat of arms, appellations, sometimes titles of nobility, emblems and colors, official representatives, festivities, patron Saints, with protectors, delimited territories and population which consist of all those people who were born or live within the topographic limits of the district, according to the proclamation issued by Violante Beatrice of Bavaria on January 7, 1730, at that time, Governess of the town. 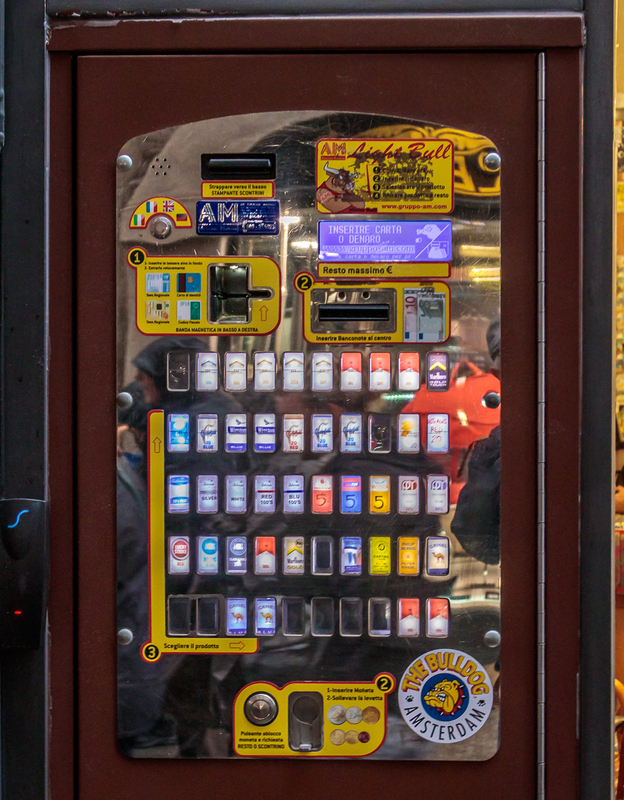 Originally, there were about fifty-nine “Contrade”; now only seventeen remain. One of the most celebrated competitions between the Contrade is the Palio, a horse race around the Piazza del Campo. The Palio is an historical secular tradition strictly connected with the origin of the Contrade of Siena. 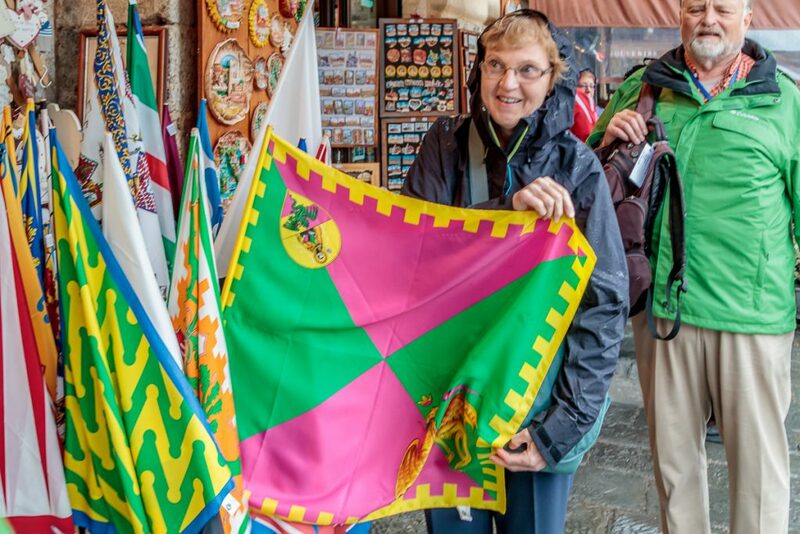 Only seventeen of the original 59 Contrade remain, ten of which take part in the historical pageant and in the race at each Palio (seven by right and three drawn by lots). 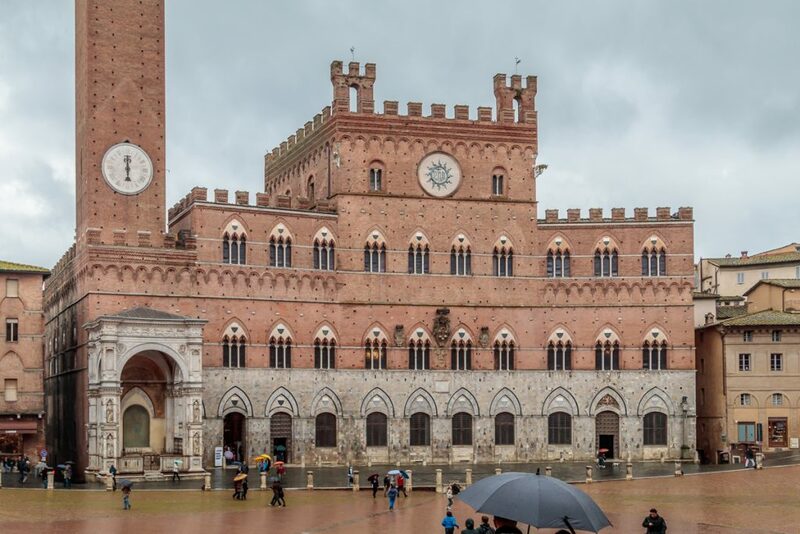 Four days before the day of the Palio trials take place in the “Campo” square which is turned into a race track. 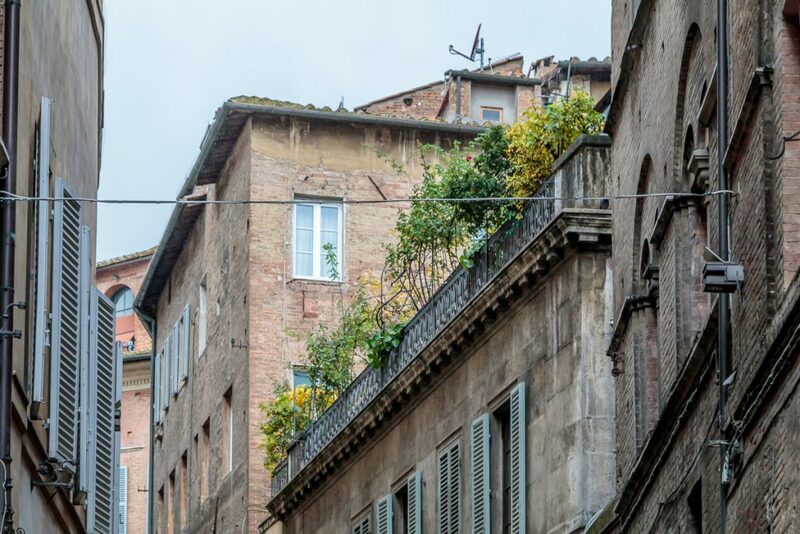 A thick layer of earth is spread on the ground and a row of mattresses is placed against the walls at the dangerous corner of San Martino to protect the jockeys in case they fall. 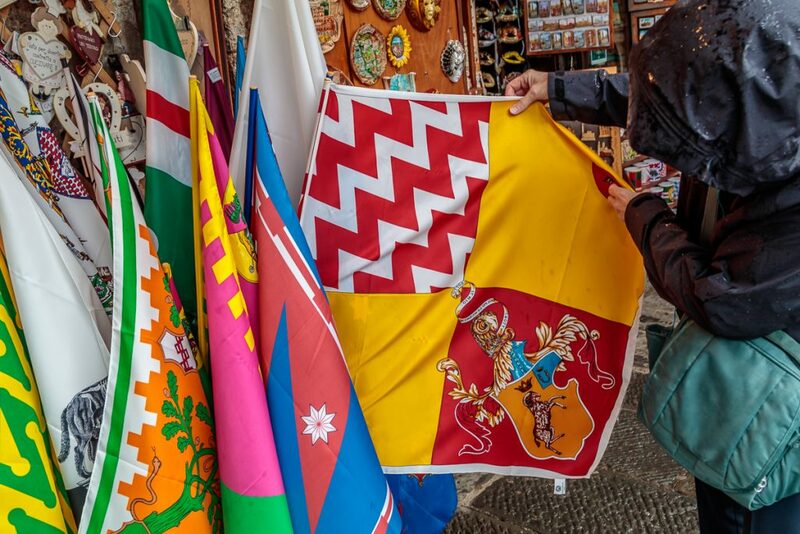 Each Contrade has its own flag as well, which were for sale in the Piazza. See http://www.ilpalio.org/palioenglish.htm for more info on the Contradas and the Palio. 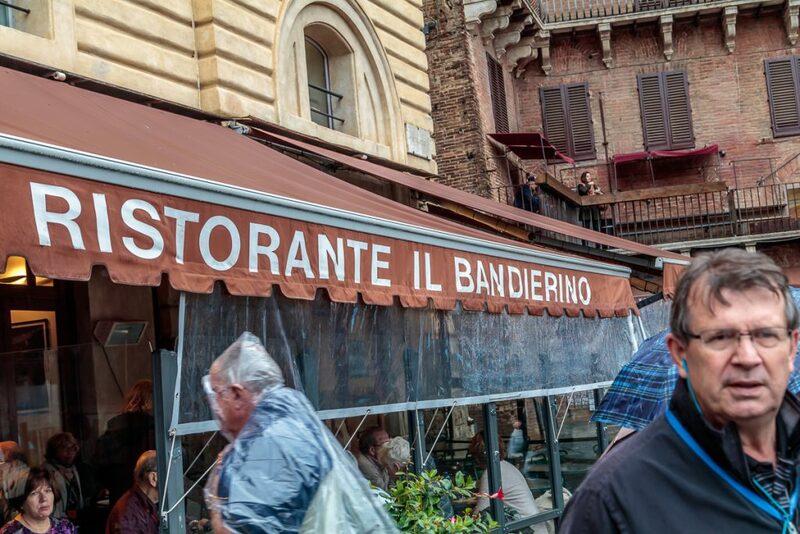 We ate a very nice pizza with a glass of wine at the Ristorante il Bandierino, under this canopy while it rained. A couple more scenes from the Piazza. And, one more scene that you won’t find in the US any more. These used to be pretty widespread, but no longer. Thanks again for following along with our Pilgrimage. Much more to come. 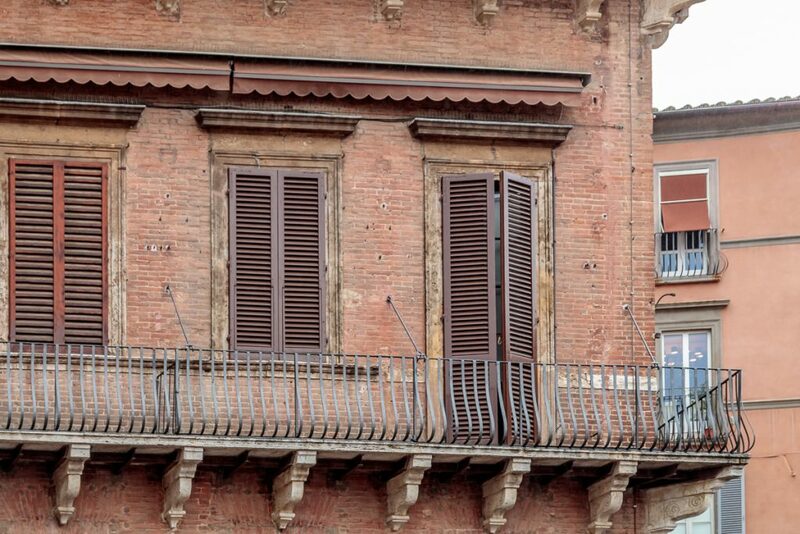 This entry was posted in Travel and tagged Italy, Piazza del Campo, Siena.